For other uses of "Kirzhach", see Kirzhach (disambiguation). 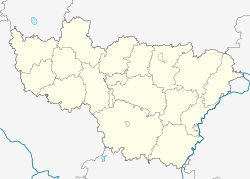 Kirzhach (Russian: Киржа́ч) is a town and the administrative center of Kirzhachsky District in Vladimir Oblast, Russia, located on the Kirzhach River in the west of the oblast, 125 kilometers (78 mi) west of Vladimir and 29 kilometers (18 mi) south of Alexandrov. Population: 29,965 (2010 Census). The town is named after the Kirzhach River. The root of the name (kirzh) corresponds to a Moksha or Erzya word meaning "left". It was established in the 14th century as a sloboda assigned to the Annunciation Monastery. The latter was established by Saint Sergius of Radonezh, who lived in the area between 1354 and 1358. For most of its history, the abbey remained heavily dependent upon the Trinity Lavra of St. Sergius, which lies 48 kilometers (30 mi) to the west. After the monastery was disbanded in 1764, the sloboda was granted municipal rights in 1778. Thereafter, Kirzhach, as many other towns in the vicinity, developed primarily as a textile center. On October 12, 2004, the settlement of Krasny Oktyabr was merged with the town. Within the framework of administrative divisions, Kirzhach serves as the administrative center of Kirzhachsky District, to which it is directly subordinated. As a municipal division, the town of Kirzhach is incorporated within Kirzhachsky Municipal District as Kirzhach Urban Settlement. City's climate is moderately continental: a warm summer, a cold winter with a moderate spring and fall. Average temperature in January is −10.6 °C (12.9 °F) and +18.2 °C (64.8 °F) in July. Mean annual precipitation is 584 millimeters (23.0 in). It averages 151 days per year with temperatures above 0 °C (32 °F). A snow cover is present for four to five months; snow starts to fall usually at the end of November or in the beginning of December. Snow melts on sun covered places in the middle of April and in forests at the end of April. Kirzhach is famous for its great monastery- Blagoveschensky cathedral.The diminutive katholikon, erected during the reign of Ivan the Terrible, conforms to the early Muscovite type of cathedral church. It is commonly regarded as one of the last and loveliest specimens of this conservative strain. The monastery has a very interesting structure- it is an open gallery. This gallery connects the cathedral with the nearby Savior church, which has a square tower and a tent-like belfry. This church is a tomb of prominent Russian boyars-Miloslavskys. The 16th-century church was demolished during the Soviet time, but people began to rebuild and reconstruct it again in 1990s. Today the cathedral is a women monastery. Since 1997, the monastery possesses the relics of the Russian Saint, Roman Kirzhachsky, the student of another great Russian Saint, Sergey Radonezhsky. Tourists can see two ancient St. Nikolay's churches. One was built in 1764, another one in 1846. On the facade of the local art palace can be found a memorial plaque that commemorates the meeting of Yuri Gagarin, the world's first spaceman, with local people on 29 March 1963. 18 km from Kirzhach (near the village of Novoselovo), Gagarin and flight instructor Vladimir Seryogin died in a plane crash on 27 March 1968. A large memorial, museum and visitors spot has been built on the crash site. Tourists can also see the buildings of old shopping malls, built in the 1850s. ^ a b Государственный комитет Российской Федерации по статистике. Комитет Российской Федерации по стандартизации, метрологии и сертификации. №ОК 019-95 1 января 1997 г. «Общероссийский классификатор объектов административно-территориального деления. Код 17 230», в ред. изменения №278/2015 от 1 января 2016 г.. (State Statistics Committee of the Russian Federation. Committee of the Russian Federation on Standardization, Metrology, and Certification. #OK 019-95 January 1, 1997 Russian Classification of Objects of Administrative Division (OKATO). Code 17 230, as amended by the Amendment #278/2015 of January 1, 2016. ). Законодательное Собрание Владимирской области. Закон №36-ОЗ от 27 апреля 2005 г. «О наделении Киржачского района и вновь образованных муниципальных образований, входящих в его состав, соответствующим статусом муниципальных образований и установлении их границ», в ред. Закона №113-ОЗ от 10 августа 2009 г. «О внесении изменений в Закон Владимирской области "О наделении Киржачского района и вновь образованных муниципальных образований, входящих в его состав, соответствующим статусом муниципальных образований и установлении их границ"». Вступил в силу со дня официального опубликования (29 апреля 2005 г.). Опубликован: "Владимирские ведомости", №140, 29 апреля 2005 г. (Legislative Assembly of Vladimir Oblast. Law #36-OZ of April 27, 2005 On Granting Kirzhachsky District and the Newly Established Municipal Formations Comprising It an Appropriate Status of the Municipal Formations and on Establishing Their Borders, as amended by the Law #113-OZ of August 10, 2009 On Amending the Law of Vladimir Oblast "On Granting Kirzhachsky District and the Newly Established Municipal Formations Comprising It an Appropriate Status of the Municipal Formations and on Establishing Their Borders". Effective as of the day of the official publication (April 29, 2005).). This page was last edited on 1 September 2018, at 14:55 (UTC).